Bonnie B. Lucia, 89, of Russell, PA., died Tuesday afternoon, August 14, 2018 at U.P.M.C. Hamot, Erie, PA., as a result of injuries sustained in an automobile accident. She was born April 14, 1929 in Warren, PA. Bonnie was the daughter of Ward and Henrietta Gebhart Bauer. 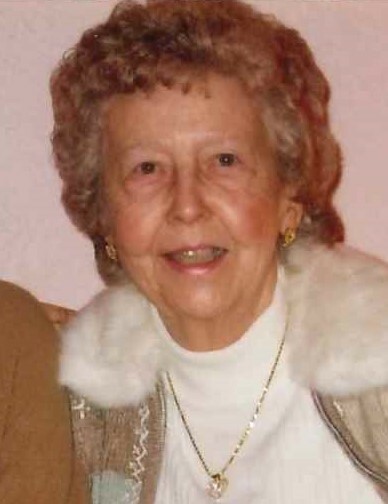 She was a lifelong Warren area resident and a 1947 graduate of Warren High School. She was employed with numerous businesses as a secretary. Bonnie was a member of First Lutheran Church. She enjoyed playing BINGO and going to the casino. She was an avid Pittsburgh Pirates and Steelers and Cleveland Indian fan. Bonnie is survived by her husband of 67 years, Frank “Butch” Lucia whom she married January 20, 1951 in Warren, PA., 1 Daughter – Stephanie Wilson and husband, William of Big Flats, N.Y., 1 Granddaughter – Meredith Rosenbeck and husband, Andy of Dublin, OH., 2 Great Grandchildren – Juliet Lucia Rosenbeck, Colin J. Rosenbeck, 1 Sister – Sally Cilano of Mesa, AZ., several nieces and nephews. I want to express how sad I was to read that Bonnie has passed away.. I moved to Warren in 1989 and Bonnie worked for me at the Bon ton and soon realized what a wonderful lady she was. She became one of my favorite ladies who ever worked for me. Even after I retired I would run into Bonnie at the Bonton and other places and would always get a hug and have a wonderful conversation catching up on what either of us was up to. She was a great lady and will be missed not only by me but by so many. My heart is so sad tonight.